My college roommate Alex and I used to cook dinner well after midnight on a regular basis. He came to visit me from Ann Arbor this weekend, and following longstanding tradition, we ended up at the grocery store late one night and came home with a large bag of shrimp. Post-midnight dinner turned into a multi-course affair utilizing lots of our crustacean finds. This was the starter. Divide strawberries evenly into 2 bowls. Sprinkle with sugar. 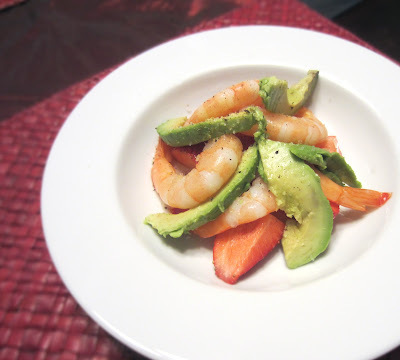 Place half avocado and 5 shrimp into each bowl and top with a sprinkling of garlic powder, pepper, and salt. It looks like a simple recipe but it's a lot of delicious flavors. I'll try this at home once I finish my Portuguese cooking classes.